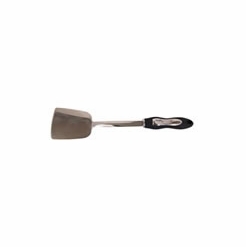 Mrs. Anderson's high-heat spatula with flexible blade is perfect for mixing, cooking, scraping down mixing bowls, and reaching every drop at the bottom of jars. Specially designed with a high-heat silicone blade (to 500-degrees Fahrenheit) and fiberglass-reinforced nylon handle, it's flexible yet strong and durable to tackle a wide range of food preparation tasks. It's the best spatula for hotter jobs, like cooking, sugar work, and candy making. 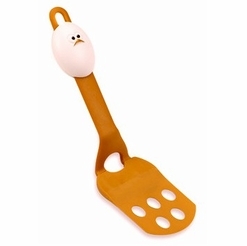 This multi-purpose spatula works equally well for mixing wet or dry ingredients, scraping down mixing bowls, cooking and stirring foods, working heavier batters or dough, even folding in fluffy egg whites and whipped cream without breaking the peaks. The beveled edge hugs surfaces to scrape them clean. A notch in the blade releases thicker ingredients quickly, like Honey, molasses, and batters. Easily dig into nooks and crannies with the pointed tip to retrieve every delicious drop and clean curved surfaces thoroughly with the rounded corner. 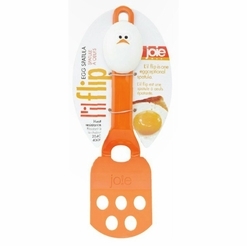 The longer handle helps reach the bottom of jars or pots and pans, and keeps hands safely away from heat. RAISED areas on both the handle and blade hover the spatula above work surfaces to minimize sticky mess on counters. Won't scratch delicate nonstick cookware. Made from high-heat silicone (to 500-degrees Fahrenheit) with fiberglass-reinforced nylon handle, strong and flexible, and safe for non-stick cookware. Dishwasher safe for easy cleanup.